Defeating cancer with a hug is possible. It’s science suggesting it, in an article published in the prestigious international journal Nucleic Acids Research. Scientists observed that the “embrace” between the antitumor molecule Actinomicin D (ActD) with some structures of our DNA can inhibit the activity of enzymes linked to the replication of cancer cells through a stabilizing action, providing valuable information for the development of new treatments. The discovery is the result of the work of a group of researchers from the University of Perugia and the Institute of Materials of the National Research Council (IOM-CNR), as part of an international collaboration. It provides useful data for the development of drugs directly targeting the diseased cells, thus reducing the need to resort to chemotherapy. The research group studied the interaction of the ActD molecule with G-quadruplex – structures of quadruple helix DNA rich in guanine (base nitrogen which, together with thymine, adenine and cytosine, makes up the DNA) located in different points of the chromosomes and, in particular, in their terminal parts, the telomeres. These regions are particularly critical because they predispose the creation of telomerase, a fundamental enzyme for cell growth and replication, which disappears in almost all cells, once embryonic development is complete. Its reactivation at a later stage, and therefore its intervention for indefinite times in the composition of telomeres can instead be the cause of the generation of a tumour. The formation of quadruplex, however, is able to switch off the telomerase functionality. The aim of the research coordinated by Alessandro Paciaroni and Lucia Comez was to find a way to stabilize the G-quadruplex of the terminal regions of the chromosomes, in order to inhibit the action of the telomerase and interrupt the process of uncontrolled proliferation of the tumour cells. To achieve this, the ActD binding molecule, which is already deployed in some drugs to treat cancer, was used. The combination of different techniques available at the laboratories of the European research infrastructures consortium – CERIC-ERIC, at the ​​Heinz Maier-Leibnitz Zentrum (MLZ) in Munich, at the Jülich Centre for Neutron Science (JNCS) in Jülich and at Elettra Sincrotrone Trieste, has provided information on the way this molecule works, towards promising results. G-quadruplexs are arranged on overlapping squared bases – generally three, in sequence. It has been observed that ActD – which appears in the form of a plate with two arms – in the interaction with the G-quadruplex places on it, putting the arms respectively above and below the structure, as in an embrace. This bond produces a chemical reaction that leads to stabilizing the G-quadruplex through their dimerization, i.e. the chemical process by which two molecules of the same compound meet in a double entity, making it more stable. The stabilized structures inhibit the telomerase, blocking the process of tumour formation. The options for further research development include a deepening of the knowledge of this molecular “embrace”, and the exploration of the possibilities to change the nature of the ActD molecule’s arms, to observe the behaviour and verify its effectiveness. Another field of investigation aims to find out how to bind ActD directly to DNA, or to study the interaction of G-quadruplex with another molecule that is specific to the telomere. 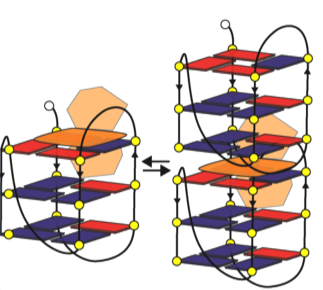 Interaction between G-quadruplex and ActD. The ActD molecule induces a partial dimerization of the G-quadruplex structures favouring their stabilization. Structure of human telomere G-quadruplex in the presence of a model drug among the thermal unfolding pathway, Bianchi F., Comez L., Biehl R., D’Amico F., Gessini A., Longo M., Masciovecchio C., Petrillo C., Radulescu A., Rossi B., Sacchetti F., Sebastiani F., Violini N., Paciaroni A., Nucleic Acids Research, Volume 46, Issue 22, 14 December 2018, Pages 11927–11938, DOI.